Hello once again, great to have you back to check out what I’ve got for the latest in fashion and etc. here at These Conversations Kill. For this installment you’re going to get a little more from The Men’s Department and We Love RP, and you’ll also see The Project Se7en at work as well. One thing I noticed lately as I’ve browsed Flickr feeds and seen postings on Facebook and the like is that a lot of people were taking snaps at a place called “The Last Forever” so I decided I needed to give it a look through and let me tell you there are locations all over this sim that could give me a lot of ideas to work with. Likely you’ll see me make it back there for another session or more. Clef de Peau has released a newer body applier for their skins that work with [SIGNATURE] Gianni and also the new NX-Nardcotix “David” body. They’ve brought these appliers out starting at the current round for The Men’s Department along with a Catwa “Daniel” based version of their “Mathieu” skin. Like with just about all my CdP skins, I chose the T2 body tone because I feel like it’s the best representation of what I want myself to look like on the Grid when I’m wearing this creator’s skin. You also get a body shape included in the package. This time however, the eyebrow shaper is absent but who doesn’t have those lying around that they can just throw in. The skin is also browless but you can purchase some from the event as well to complete your facial look. The Jeans I am wearing come from The Men’s Dept. as well and are the “STEFOV” from [ VERSOV ]. The best thing about these jeans is that if you own any of the shoes from this creator they are compatible with them and you won’t have to worry about trying to fit them or be frustrated by any sort of clipping as can happen with some products not working well together. The package comes with sizes for the following: [SIGNATURE] Gianni, SLink Physique, and TMP mesh bodies. When you see a store put out three separate exclusives to an event you know that they’ve put a lot of time and effort into bringing you some of their best work. MESANGE is one of those brands that is constantly pushing and creating captivating eyes for both everyday practical use and also for those who like to immerse themselves into the fantasy parts of the grid. 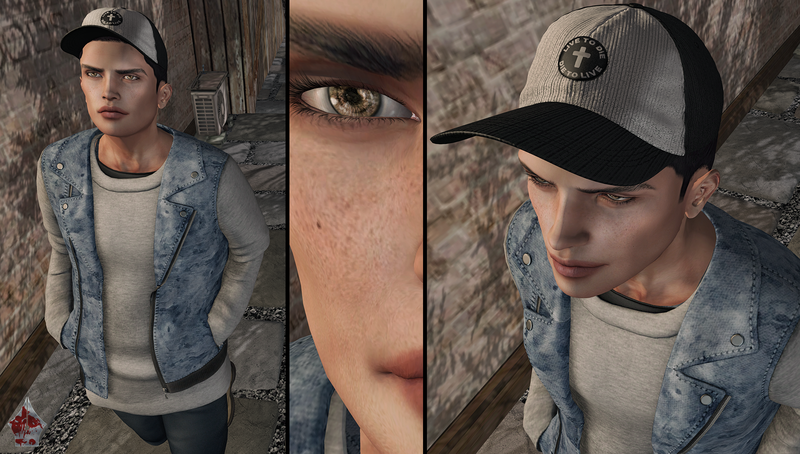 The “Bering Sea Eyes” are the third and last exclusive from We Love RP for the current round. There are 15 different tones and if you cannot just choose one then why not get the full pack which is well worth the price. With the included HUD you can either change the included mesh eyes or if you have ones that are Omega Compatible you will be able to change those as well. The “Men Only Hunt” is in its ninth installment this year with a plethora of great designers and items. You may remember the first coverage I did of this was the MESANGE product. I’m back with another new one and this time it is by Avi-Glam. Avi-Glam is usually a store that you can find skin and eyes for both males and females but this time they’ve gone out of their comfort zone by releasing the “Acid Washed” Jacket. If you are lucky enough to find this prize, it contains standard sizes so you may have to do some adjusting to your avatar depending on how your body is structured. I managed to wear a medium and with using the alpha cuts on my Gianni body were able to make it fit great. The Hunt is active throughout the whole month of April so there’s plenty of time to find this item as well as the other 47 that are available at this time. For more information on the hunt itself you can visit their website as well as get the taxi to pick up the handy HUD to start you on your journey. I look forward to bringing you more items from this hunt as well as some new events that are just opening up such as Pose Fair ’17 and also more from The Seasons Story: Spring Round. Now that you have the details for what you see you can look down below in the credits to get a taxi to these great stores and events as well as take a stroll through The Last Forever. Catch you around the bend, and until next…stay stylish fellas! Next Post [#362] How Did You Love?